What Differentiates Closed Circuit Cooling Tower From Open Circuit Model? Cooling tower is used to regulate water temperature and circulate it throughout the cooling systems that are used in settings like oil refineries, chemical plants, and petrochemical plants. These are also used in HVAC systems. Cooling towers release waste heat to the atmosphere via cooling of water stream to a lower temperature. Manufacturers offer two types of cooling towers- closed circuit cooling tower and open circuit cooling tower. A direct open circuit design has an enclosed structure that transfers warm water over a labyrinth-like fill or packing, that offers an expanded air water interface for performing air heating and evaporation. The water cools down when it falls through the fill and is then collected into water basin placed below. The heated moisture-laden air leaving the packing is released into the open air. Closed circuit cooling tower is also known as dry cooling towers that have no connection between air and fluid being cooled. Engineers intend the design of closed circuit cooling tower with two separate fluid circuits, one in which the fluid is re-circulated on the outside of the second. The air evaporated through this cascading water put cooling impact on the tower; however, the cooled water never develops direct contact with the air. 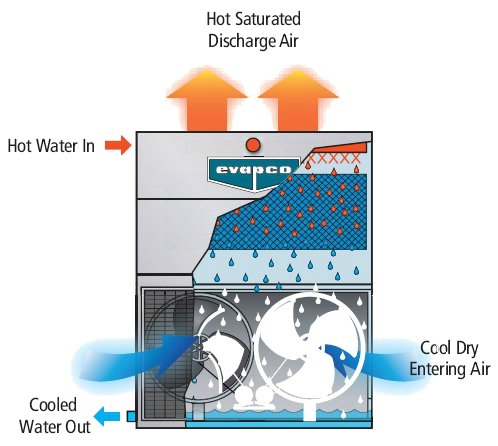 Closed circuit design includes a separate heat exchanger package with an open cooling tower. The fluid on hot side of the heat exchanger doesn't make direct contact with air, which allows the heat exchanger to stay protected from outside weather elements along with other several system advantages. Both the Manufacturers of closed circuit cooling tower and open circuit cooling towers are effective equipments to cool down the water, yet both of them have distinct performance principles and operability. You can anytime get in touch with reliable manufacturers like Tower Tech and book your choice of cooling towers.